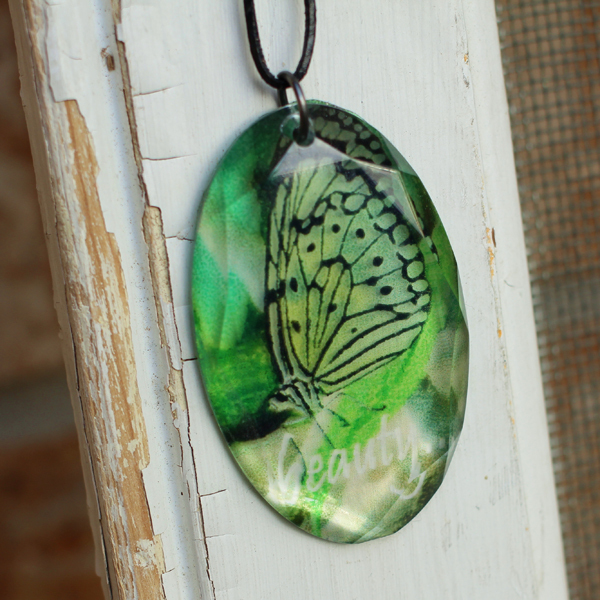 Project Description: Make your own stylish acrylic pendant. Just print your favorite photo, design or saying on Computer Grafix Adhesive Backed Film. Voila… a custom look that will match any outfit! Open photo in photo editing program. Crop photo; keeping shape of acrylic crystal in mind. Add desired text to photo. Flip photo horizontally to create mirror image. Print a test copy on regular paper, check size with crystal and adjust if needed. Print on sheet of Computer Grafix Adhesive Backed Film; let dry. Place flat back side of crystal over photo, trace around crystal with pencil and cut out. Trace around crystal again on a blank space on the adhesive sheet; cut out. Remove backing from photo and adhere to back, flat side, of pendant; do not burnish yet. Remove backing from clear piece and adhere over photo. Lightly burnish both pieces using your finger. Punch hole and insert jump ring at top of pendant. Cut cord to desired length, thread through jump ring and knot ends of cord.